I finished listening to this Stephanie Plum at least a month ago and returned the audio CD back to the library. I should have written the review up immediately, because now the plot details are fuzzy in my head. And here’s why. Because so many plot points are recycled. My memory may be fuzzy, but I do remember hitting all seven of these at least once. I’ve said it before, and I’ll say it again (just like these Plum novels – wink, wink) – if you’ve read the beginning of this series, you’ve read ‘em all. 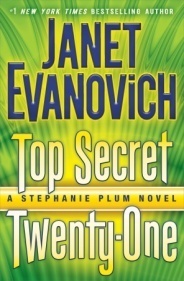 Ms. Evanovich would do her readers a great service if she would just have Stephanie choose between Morelli and Ranger, and take the next step in her life. …and I think this means just two Plums to go! #7 (no audio at my library, so who knows when I’ll get to this one) and #18. Fun Bonus – Visit TimeyWimeyBooks Goodreads Review for their Stephanie Plum Drinking Game! But don’t actually do the drinking game while you are reading a Stephanie Plum novel. I guarantee you will give yourself alcohol poisoning. Oh I tried to listen to this one earlier this year. I didn’t make it far. The charm was gone for me. I used to like them so much but either my tastes have changed or they started to decline even more. I suspect both. Great review and love the seven points!! I don’t think it’s your taste – I loved the beginning too. But as the books have gone on the hijinks have gotten out of control and the plot points recycled. I think I read the first 6 or 7 and stopped because it was starting to feel repetitive and I wanted her to pick Joe or Ranger and be done with it. Specifically I wanted her to pick Joe. Ranger seemed a little sketchy. I’m kind of surprised to hear that it’s kind of in the same loop that it was in 12+ years ago. I don’t think I’ll be restarting this series anytime soon but I might try it in audio because they were a lot of fun. Yeah she’s got to pick between them. And get some new plot points. You forgot Tastykakes and Stephanie feeding her hamster (who’s hiding in a soup can) inappropriate food. 😉 I am totally with you on the series being tired and redundant — and yet I will keep on reading all the books until Janet Evanovich stops writing them! Even though they’re ultra-predictable, there’s something comforting and fun and easy about going back to a place and characters I know so well. Yes!!! I will add those two next time. Ha!